Hello and Welcome every one from one world one heart to my small part of Blogland! My name is Niky. I'm a stay at home mum (to one loud pre-teen girl, my nephew whom has ADHD and a toddler I refer to as mess maker)!!!! I love making things and trying new crafts, and may possibly have a small addiction to beautiful handmade glass beads, shiny gems, stationary, filo faxes and such, and am possibly starting to hoard said items! I mostly make jewellery, but there are soooo many other things I would love to try! My nickname when I was younger (I was going to say small but I'm only 5ft, so I'm still small) was Dolly Day Dreamer because I was ALWAYS reading books (my grandads fault for constantly supplying me with books)! The best job I've ever had (and the worse paid) was working as a care assistant in a residential care home for dementia. I learned so much about showing people respect and promoting independence (I also loved that the conversations were completly random) and went on to train other people about being a carer. I consider myself to be very lucky, am a great believer in positive thinking and love the idea of Karma! (I once wrote a complete A-Z of lucky things for my best friend and started to send her things off the list randomly). I am increadbly ditsy, I will start something then a little way in will get distracted and start some thing elce having completly forgoten what I was doing just a few moments ago, and this happens ALOT! This handmade (by me) sterling silver bracelet. All you need to do to win this prize is leave a comment and a way for me to be able to contact you should you win. The winner will be picked by random number generator on 17th Feb.
Yea! I'm so glad to be here and to meet you. You have an awesome blog, come check mine out sometime. Thanks for entering me in your contest! It's nice "meeting" you. Please enter my name in your lovely drawing and be sure to stop by and enter mine as well. So very nice to meet you. You're work is lovely! I would love a chance to win your giveaway. Very pretty bracelet! 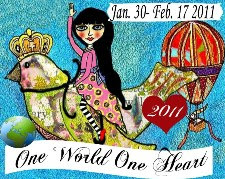 Enjoy One World One Heart! Hi Niky (Kim) it's nice to meet you. Your jewellery is beautiful. Wow beautiful bracelet! Just discovered your blog and i like what i see so i am following. Here I am on my Flying Around the World visiting all the wonderful Blogs that are participating! Thank you for the opportunity to win your Beautiful Bracelet giveaway! If you have not done so already Fly on over to my blog and enter my giveaway! wow, that is a lovely bracelet!!! What a beautiful piece of art! Love it! Gorgeous, would love to win. If you have a minute please come and visit my giveaway too. Thank you for participating this year...I have added your blog to the link list. I hope you enjoy the ride! Hi Niky my name is Sharon and I believe in the power of positive energy and Karma also. I also have worked in the health field trying to make a difference in the life of altizmers patients. You have a wonderful blog and I have become a follower. It is nice to meet you. I was a nursing assistant for 11 years, so I know the hard work that it was. Then I was going to be a nurse and did all my pre-nursing classes...ended up being a Medical imaging tech instead, and now I am disabled. Love your blog! Its very pretty just like the beautiful bracelet! Please count me in and have yourself a fun OWOH blog hop. Lovely to meet you Niky (or should that be Kim! )- your bracelet is gorgeous! I hope you'll come to enter my giveaways too on my blog. Hi! GORGEOUS GIFT! PLEASE COUNT ME IN! Hiya Nicki great to meet you - I too have worked with people with Dementia and Alzheimers and know how mush hard work but how very rewarding it is. Your bracelet is beautiful, and I´d love to wear it, so please enter my name to your drawing! Thanks for letting us know some facts about you, it´s nice to meet you at OWOH! Please have a look at my own blog and giveaways if you have a moment. I'm participating for the first time myself. Do stop by and have a look! Pretty jewelry you have, what a nice giveaway! Your bracelet is beautiful, I love the whole design and the colour. It is nice to meet you. This year, I am starting to visit the UK bloggers! Why not? The bracelet is lovely! Niky- well it sounds like you have your hands full in many ways girl! This first give away is perfect... congrats on it being your first. I hope you will have time to pop over and check out mine. yes I too worked as a care assistant for the elderly one summer and I agree, bad pay but interesting job. The old folks get back to being like the young and say and do what pleases them, so it can be pretty funny at times. My favourite number is 5 and I too was (and am) an avid reader and... I am forgetful too. I go upstairs and forget what I wanted to fetch - old age I guess. Please enter me for this incredibly, generous and beautiful prize !!! And please stop by my blog if you have time. Hello Niky ...so pleased to visit you and your blog is lovely. I am a Canadian Mixed Media and Digital Artist. I hope you will visit my blog as well. Thank you for including me in your wonderful gift draw. Hugs, Gayle. Beautiful! Please enter me in your giveaway! Lovely, please enter me in your draw & feel free to drop in on me at 100. Hi Niky! Love the name! My youngest daughter is Heather Nicole and I call her heather. My sister wanted me to call her Nicole so she could call her Niky for a nickname! How cool was that! Well, I had always wanted to call her Heather so I stuck by what I had always wanted to do. But Niky would have been a cool nickname for her. I absolutely LOVE your bracelet! If I won, I would most likely give it to heather to wear as she adores jewelry! I am your newest follower! Hope you follow me back! Lovely bracelet! This is such a wonderful project that Lisa has hosted! Please enter me in your giveaway! What beautiful prizes, you are so talented! The ditsy thing cracked me up...it describes me to a T! LOL! Beautiful bracelet, you're a clever and talented woman! There are two giveaways at Thistle Cove Farm, come visit. I am so happy to meet you today on the wings of OWOH! Thanks for a chance to win your wonderful giveaway. Stop by for a chance to win my giveaway! Beautiful jewelry!!! Please enter me in your giveaway and come enter mine, too! You make very gorgeous jewelry! So happy to visit. Hi Niky, its great to meet you and read your blog. I also am an avid reader and can easily understand getting lost in a book. You have a lovely giveaway and a lovely blog. So nice to meet you. Thank you for the chance to win this wonderful bracelet. It looks amazing. Come and visit my blog for OWOH. You put a smile on my face and I got such a warm feeling reading about you and I will definitely come back. Your bracelet is to die for! Hope you have so much fune during OWOH. You picked a great event during which to hold your very first giveaway. The bracelet is so pretty and perfect for this event. Count me in please. Lovely to meet you Niky:) Your jewelery is gorgeous and I would so love to win your beautiful bracelet. Isn't it great finding all these wonderful OWOH blogs. How adorable! I love the heart theme tying into the blog hop! Please count me in. thank you! Hello Niky! Nice to meet you. I'm afraid I'm quite ditsy too :) Such a valentiney prize! Hello Niky! We have the same height, I consider us very "down to earth"! What an exquisite bracelet! Hope you can drop by my blog too! Your bracelet is divine! It must be so hard to give away, being your first. If I win, I will treasure it for sure. Thanks so much. PLease come by to see me as well...#92. So nice to meet you Niky! What a lovely bracelet you have made. Please enter me in your draw and come over to my blog and enter mine. Thanks! The jewelry is just beautiful! Thanks for the chance to win! Welcome to OWOH! What a beautiful bracelet! Thanks for a great giveaway! Beautiful! Come by and see me! I am #78 in the OWOH event. gorgeous! Luv your jewelry, your widgets featuring your craft are great, very nice blog. How goergeous !!!! Loveeeee your bracelet !!! Thanks for the chane and happy OWOH !!! Oh, beautiful jewerly, Niki, although I love the nickname you have too, really cute. And I have ADHD too, so I know how challenging it can be for your nephew ;) I would love to enter your giveaway! Hello Niky Kim, I'm curious about the number four and how it became your lucky number. I hope you enjoy OWOH. Have fun! Your work is beautiful :-) I'm a silver jewelry artist as well, making me a total jewelry addict, lol. I'm enjoying my first time participating in the OWOH. So many great blogs...so little time, lol. Feel free to stop by my blog and enter my giveaway as well! That bracelet is fantastic! Wish I could make jewelry. It's been lovely to "meet" you. I'm a OWOH participant as well. Hope you'll drop by and visit with me! Make sure you come over and enter my own giveaway if you haven't done so already! Oh wow! I love this bracelet. I'm a bit like you and get distracted, too. I'll definitely be back to visit again. I'm #11 on the blog list. Nice to meet you! This event is so much fun already and it just started! Love your bracelet!! Stop by and visit me I am also in this wonderful event! Your bracelet is lovely. I love the chain work. I do hope that you will come by for a visit with me while exploring all the amazing blogs on OWOH. Lovely necklace--love the way you did the clasp. I also worked in a home for patients with dementia while in college--very rewarding indeed. Thank you for the opportunity to meet you and see your art. Beautiful bracelet, love the crystal accents. Looks like you put a lot of effort and great care into making it. Thanks for a chance to win it! Hi Niky! This bracelet is too sweet! I get completely distracted with I'm creating too, I always have about 5 projects going on at once! lol Thanks for sharing a little bit about you! You're welcome to my OWOH post anytime! You made it .... I am impressed. I'm also a dolly day dreamer and a tad ditsy LOL!!! Lovely blog, you take some beautiful pics! Hope you have time to hop over and visit my OWOH post. Beautiful bracelet. Thanks for the chance to win. We have several people in our family with names changed also. Niky your bracelet is lovely - you did the chainmail as well I am guessing. I used to make jewelry but now make handmade books and cloth art dolls, well, if I am honest I make lots more stuff too! You are not ditsy just excited and preoccupied with art (we are all like that)! Hi Kim, Nice to meet you. Your bracelet is beautiful. It is so nice to hear kind words about dimentia patients because my mom is in the middle stages of that disease. You have blessed many people through your kindness, I'm sure. In love with your blog...stunning givaway! I am now following. I would love for you to come to mine and follow to...love new followers but most of all I love new friends! Beautiful! I'm a new follower. Your random facts are so fun! I didn't think to put something like that on my post. If you'd like to visit my blog at www.greenislescrafts.com, I'd be happy to have you enter in my drawing as well. It's my first give away too! Beautiful...count me in to win! Gorgeous bracelet! I'd love to wear it! Stop by and visit my blog to see my OWOH giveaway! Follower #45 ;) You do gorgeous work! I think care givers are a special breed. It takes an amazing person to do a job like that. I think I would have the temperament for it but not the patience. I couldn't do it myself but I try to help people as I can. I think your silver jewelry is beautiful. I love the designs. Hope you have a great time at the OWOH and it's really great to meet you! Oh, how cute! Glad you joined this event! I also am participating so drop by when you get time! Hi Niky :-) nice to meet you. Very pretty! I am in awe you made that, I have never made nice jewelry before. Blessings from Jessica in Colorado! thank you for giving us the chance to win your sweet doorprice. Please count me in for your giveaway ! What a pretty blog and a nice bracelet. Thanks so much for participating. Beautiful necklace! It is nice to meet you!Check my OWOH gift! Hi. My lucky number is 8. My name, my Real name is Amber, but my whole family and everyone I know calls me Amy. My parents named me Amber and then promptly decided the name was pretentious and started calling me Amy. you and me are sort of twins. Because 8 is a multiple of 4. And we both have mix-y upp-y names. And I bet you, like me, hate really short comments that people leave just so that they can have your door prize which they may not even want. Then you have to pay a lot of money in shipping. Anyway, I do like the necklace. I hope it goes to a good person. I am not always a good person, but I sort of hope I get the necklace anyway because it is mighty fine. Funny story about your name. I think I will call you Kim also! Gorgeous - please cont me in. Thank you! WoW! Pretty Blue! Love Your OWOH Giveaway! Nice to meet you. You have offered an amazing giveaway ! Beautiful bracelet! You do lovely work, Kim, er...Niky...er...Kim. It is good to meet you on OWOH! Have fun! Oh goodness this is just beautiful! I sure do hope I win.. wow! Simply lovely and a perfectly goes with the one world one heart theme with the heart. So nice to meet you through this event! Thanks for including me in your draw..Come visit me, I am playing too. Great giveaway! I have to admit I'm a little ditsy too. I love it that you have two names! Thanks for following my silly blog! Love your bracelet...and your blog! I'll be back to visit longer soon! I love being crafty, too (and can get sidetracked as well). I am learning more and more about the power of positive thinking. Wow so many comments. Hi and nice to meet you. I am new to OWOH, what a great idea. I also make jewellery and attend silversmithing classes. Your bracelet is very beautiful! Hi Niky, sounds like you have a full house :D Your bracelet is stunning, please add me to your drawing. I hope you'll stop by my blog for your chance to win. And that starting one thing and something distracts you...well it happens to me too :D Oooo...shiny! Nice to meet you! Very Pretty door prize. This is my first year at the OWOH event and I am enjoying reading everyones Blog..Who ever wins your prize will be very blessed..
What a lovely bracelet to give away! I would love to stand a chance of winning it. Please put my name in the hat. Lovely to meet you Niky (Kim!). Thank you for participating in this wonderful event. Nice to "meet" you! Your bracelet is so pretty. I would love to win it. I came to visit via OWOH and couldn't resist staying for a bit. Your blog is lovely! Please include me in your drawing for the beautiful bracelet. Hi Kim uuuhhh I mean Niki LOL My name is Nicole but when I was youngy went by Nikki. It is nice to meet you. Please count me in on your door prize. Beautiful bracelet! Please do drop in to my Chronicles of Whimsy blog as well! Thank you so much! Your beautiful bracelet is a wonderful gift and I´ll be more than happy to win it, or any other prize during this journey! Great to meet you Niky, Your braclet is beautiful. Please add me to your long growing list. I'm #65 if you have a chance stop by. Your Dad sounds much like mine who found it highly amusing to name me Carmen Miranda. If I only had £1 for every time someone sang "AY AY AY AY AY Like you verrrrry much!" Dads eh! how lovely to read your post. I can't imagine be called two very different names by your family. What a weird and wonderful story! Beautiful. I think I mean you along with your gorgeous bracelet. You sound like the kind of person that it would be fun to hang around with. Good luck with your hop and I hope you get a chance to visit my blog. Hi, nice to meet you. I'm number 96 on the list. Please enter me too and stop by my blog to enter. Happy OWOH to you. This is beautiful and a wonderful blog. Be sure to visit mine too! Hi, just drop by to say how lovely your blog is. And those jewelry really catches my attentions. They are simple yet had the power the possess beauty to a person who might were them. Gorgeous bracelet. I rarely finish big projects right away myself! That is just beautiful! I am a participant but won't be on the list for a couple of days. I hope you will visit! Your bracelt is gorgeous, and the beads my favorite color. I also have a jewelry giveaway. So glad to have come upon your blog. I have a 7 year old girl so I can relate to the noise level. Love the Audrey Hepburn quote. I will have to write that down. Your jewelry is beautiful and I would be thrilled to win. Thanks for the chance. Hi Niki. What a fabulous and an oh so beautiful giveaway. I'm not listed yet so would be real pleased if you could stop by my blog for a visit too. I can tell you are a very talented jewelry maker...your wraps are so tight! I get one like that about every 5th try...haha! Unfortunately, that's about every 6 months , or so, since I like to have my hands in a lot of different creative pots, too! Hope to see you at my blog...I'm # 83! Hi Niky! What a great intro you gave to everyone up there ;) And an awesome giveaway too....isn't this such fun? I just took the time to look through your blog -- great artwork. Your prize, the bracelet, is just lovely, too. Thanks for the chance to win such a goodie. Niky both are absolutely gorgeous!! I'm also participating but not yet listed, come by if you wish..
Hi Niky - it's so pretty! I hope I win! So beautiful, you are so talented. Thank you so much for dropping by my blog and entering my giveaway. Please pplace my name in the hat for your lovely prize. It's so delicate and feminine, I love it!